One of my favorite memory snapshots of Phil and Jan was of when they joined a bunch of us in England for Gavin's pub opening. 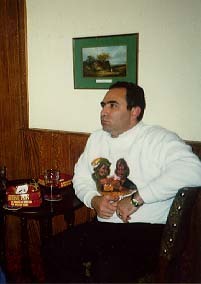 About a dozen of us flew to England for the opening of a friend's pub - The Robin Hood and Little John - a few years ago. Phil and Jan took the opportunity to tour Ireland.....do some single malt scotch tasting and some hiking. They looked so happy when they whirled into the Redcoats Inn to meet us. Jan had a big Irish wool wrap slung over her shoulder and Phil was grinning that grin.....Everyone should be lucky enough to be that much in love.